The US Air Force’s F-35A fighter squadron at Kadena Air Base, Japan, has been flying at a relentless pace since the squadron’s aircraft started to arrive at the base in late October, according to a new report. "We're approaching 1,000 flight hours and 500 sorties; we'll probably have that here in the next few weeks," Master Sgt. Brian Sarafin told Defense News in a report published Monday. An average day consists of the 12 F-35 aircraft flying between 12 and 14 sorties per day. Since the plane is frequently damaged or malfunctioning, repair and maintenance crews are working "around the clock" to keep the planes ready to fly, Defense News noted. The service described the deployment as a "long-planned deployment" that is "designed to demonstrate the continuing US commitment to stability and security in the region" in an October news release. Outside of that description there have been few details about what the F-35s actually do during their sorties. Sometimes the aircraft will participate in annual exercises like Vigilant Ace; at other times, the aircraft meet up with other US-operated F-15C jets or South Korean F-16s, the air force official said. "And I believe that they've also met up with [Japan Air Self-Defense Force] airplanes a time or two as well," Sarafin added. A fighter pilot with the F-35 squadron said that the experience of flying with other airplanes "was enlightening, as it allowed us to learn the intricacies of each other's operating capabilities to further strengthen what we bring as a whole to the fight." The fifth-generation planes have worked surprisingly well, all things considered. "When we first got here, we went over 130 sorties" without needing a major maintenance fix, "which was great for us and kind of unheard of for a new platform like that," Sarafin said. Tensions have simmered between Washington and Pyongyang for nearly a year, in no small part because US President Donald Trump announced before the United Nations General Assembly last fall that "the United States has great strength and patience, but if it is forced to defend itself or its allies, we will have no choice but to totally destroy North Korea." At least one expert doesn't think the F-35s will be used to intimidate Pyongyang, but that doesn't mean they won't be collecting data on the country. "I don't think that there will be anything inflammatory done in an overt posturing," according to John Venable of the Heritage Foundation. "When you have guys out on the [US Navy's USS] Wasp and they're flying [F-35Bs], if they're flying 100 miles off the coast of North Korea, you can bet your bottom dollar they're scooping up gobs and gobs of information of what's going on inside the peninsula and then the northern side of the peninsula," the senior fellow said, referring to the plane's classified electronic warfare capabilities. "And the same thing is going on the with [F-35As]." 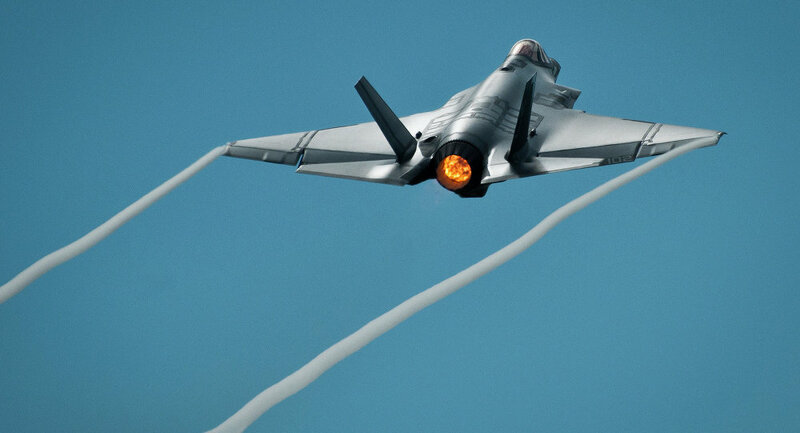 Last week, a senior US Defense Department official admitted that "right now, we can't afford the sustainment costs we have on the F-35," which are estimated north of $1 trillion over the plane's 60-year life cycle.